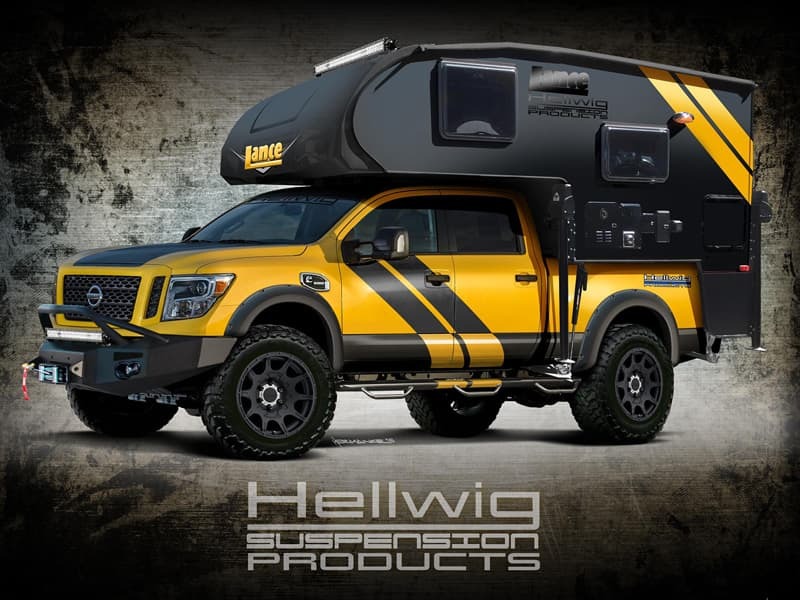 Hellwig Products and Lance Campers have assembled another over-the-top truck camping rig for the annual Special Equipment Market Association (SEMA) show. This year, Mike Hallmark of Hellwig Products took the design lead and created what might be the coolest looking truck camper on the planet. 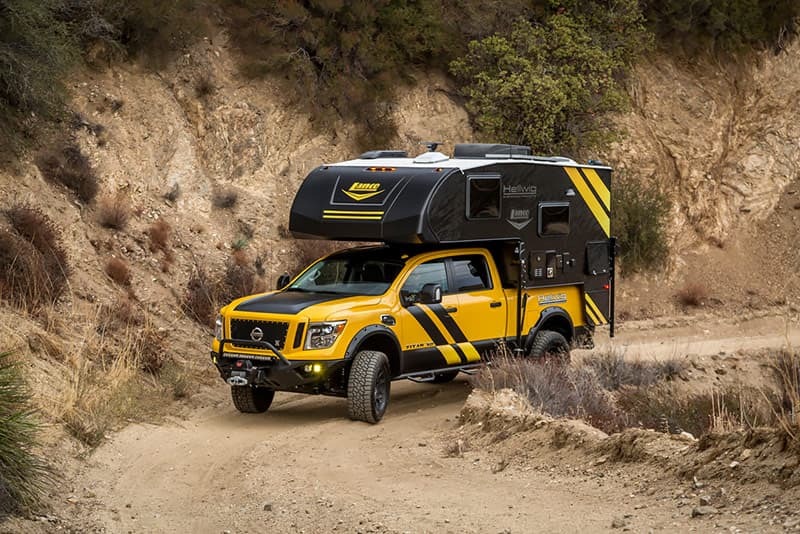 Looking like a cross between a gigantic yellow jacket and an extreme overland truck camper rig, this set-up is visually stunning. Can you imagine pulling into a gas station, parking lot, or campground in this thing? You’d have people taking pictures, asking for your autograph, and generally asking you endless questions from coast-to-coast. In 2015, Nissan launched a redesigned Nissan Titan, and the all-new Titan XD. While the standard Nissan Titan remains insufficient for anything more than a bare bones pop-up, the new Nissan Titan XD is another animal entirely – especially where it counts. For starters, the Titan XD has a new heavier-duty ladder frame. 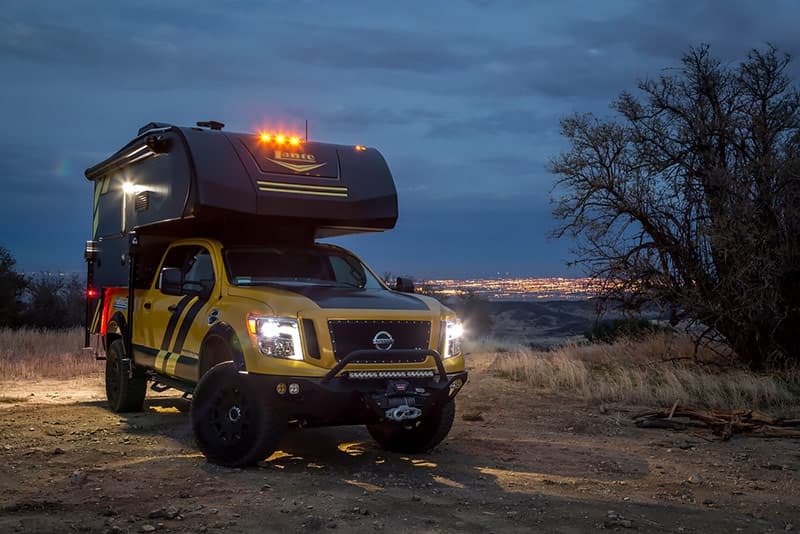 Inspired by their commercial vans, the frame is responsible for the increased payload offered by the XD, up to 2,500 pounds according to Nissan. As compelling as the stronger frame is, it’s the Cummins 5.0-liter turbo-diesel V-8 engine that really had the automotive press buzzing. With 310 horsepower and 555 lb-ft of torque at 1600 rpm, this engine has folks from every corner of the pickup truck marketplace taking a very fresh look at Nissan. What has us even more excited is the potential of a gas-powered Nissan XD. Take the same heavy-duty frame and mate it with a lighter gas engine and transmission (the diesel has a six-speed Aisin) we might be looking at payload numbers closer to 3,000 pounds. With the right gas engine, that could be another game changer. An Overland SEMA Statement – To Go! 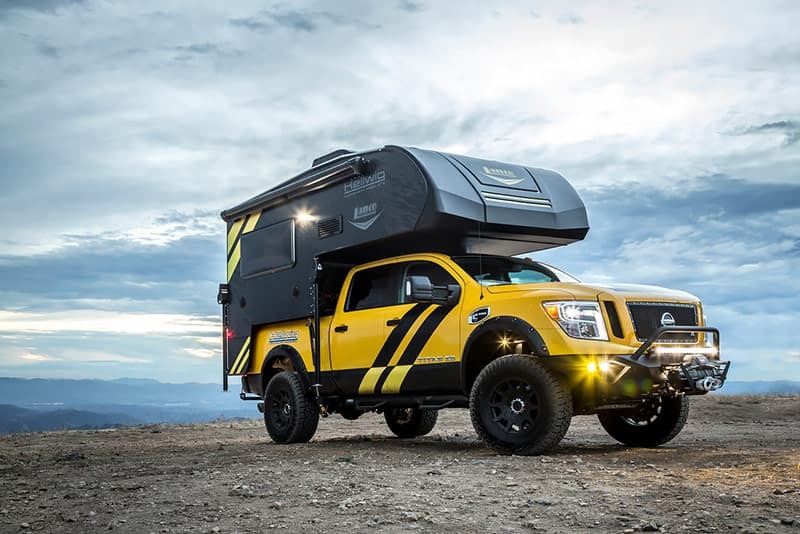 To get the behind the scenes story on this outrageous overland rig, we contacted Mike Hallmark of Hellwig Products, and Bob Rogers, Director of Marketing for Lance Campers. First we talked to Mike Hallmark. TCM: Hellwig Products has been showing products and vehicles at SEMA for many years. After showcasing a truck camper at SEMA in 2015, why are you showcasing another truck camper rig at SEMA this year? Mike: We are taking a truck camper to SEMA again this year because the tow and haul marketplace is our bread and butter. Last year we broke the mold with the F150 and Lance 650 combination, and destroyed any notion that truck campers can’t be cool. This year for SEMA we wanted something to capture the eye. I think we’ve done it. TCM: How was the Nissan Titan XD selected for this build? Mike: The Nissan Titan XD is a different truck from anything else on the market right now. Not only does it offer towing and payload capacity between a half-ton and a three-quarter ton, but it also features a new Cummins diesel engine. We worked closely with Lance with the specifications of this rig. The Nissan Titan XD offers up to 2,500 pounds of payload putting a loaded and wet Lance 650 within the payload limits of the truck. TCM: For the record, that would be a 2-wheel drive base model Nissan Titan XD. Tell us about the Big Wig air springs that were utilized for this build. Mike: The Big Wig air springs have been out for about seven years now. They are a larger capacity 2800 pound air bag. Since the bag has a higher volume, you can decrease the air pressure up to 40-percent. Lower air pressure means you have a softer, more factory-like ride.